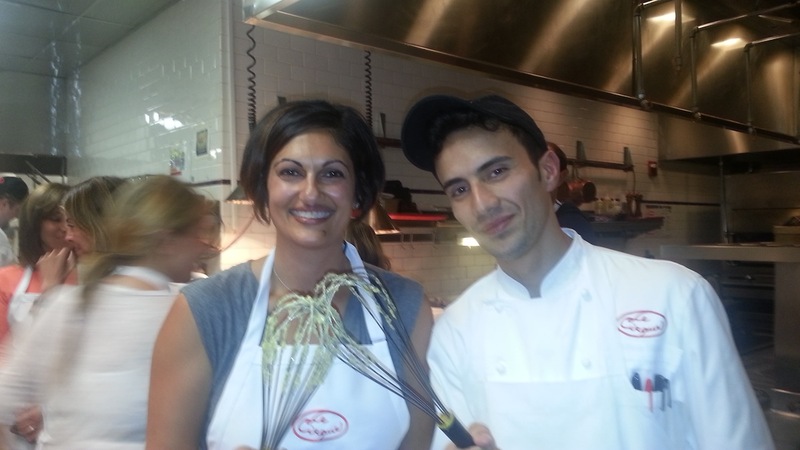 Cooking Class at Le Cirque! A cooking class- for whom you ask- well, me, of course!! 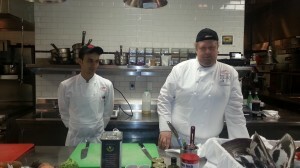 It is a great way to learn new tricks from cooks/chefs any chance one gets!! Especially when it is at a New York institution like Le Cirque!! I found the offer a few months ago on GiltNYC and jumped on it. I was very excited to be going into the kitchen in one of the most prestigious restaurants in NYC! The class was offered on a Saturday from 11:30 to 2:30. The certificate stated, I would enjoy a meal, a glass of Prosecco and a goodie bag consisting of their famous cook book in addition to the actual class. I walked into the grand space and found about 5 to 6 people already waiting in the bar area. I signed in and sat down to wait for the class to start. I noticed the dining room was empty with one table in back set for all of us to sit and eat later. We were soon ushered into the kitchen and two chefs were waiting for us with a variety of fresh foods sitting in front of them. We got started fairly quickly with their famous Lobster salad that is an original Daniel Boulud recipe which they still use. 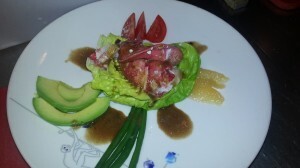 The salad consisted of fresh lobster which were immersed into boiling water as we received the rest of the instructions. The chef precisely sliced three slices of a tomato, three slices of a grape fruit, four haricotverts, three slices of an avocado and three squares of potatoes, poached slowly in oil. He placed everything on a plate and showed us how to make this delicious looking salad which was topped with a black truffle dressing. We made our way to our stations and proceeded to replicate the plate of delicious looking salad. Some time later, I managed to come up with a reasonable looking plate. 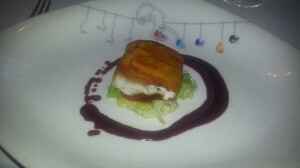 Once the salads were placed on the large table in the dining room, we came back to the kitchen to learn how to make Paupiette of Black Bass served on top a bed of leeks cooked in reduced cream, drizzled with a red wine reduction sauce. We watched the chef expertly filet the fish and form it into a shape and surround with a coating of flash fried, thinly sliced potato. It was then sauteed in clarified butter and cooked for precisely 2 minutes each on all four sides- 8 minutes all together! The dish of amazing looking- and better than that- it was delicious. Watching these hard working chefs, one realized how many steps went into one simple looking dish! Next came the dessert! Bombolonis were served- which are small Italian doughnuts! The pastry chef showed us all the ingredients and the procedure. We proceeded to make pastry cream to be served with the doughnuts. We split into a few different groups and went to work. After getting all the ingredients together and cooking according to direction- we managed to separate our pastry cream!!! Turns out, it was the way we were whisking it- if one decides to whisk clock wise, then one needs to continue and not change directions. Changing directions can separate the creme… According to me, we had over cooked it.. either way- we messed up! Its a good thing they had plenty of pastry creme already chilling for us for later! After a few minutes, we were ushered into the dining room to enjoy our meal. We started with the salad we made- it was delicious but lacked some seasoning- so I added salt and pepper. The fish was amazing, soft and luxurious inside with a crispy crust on the outside. The leeks were subtle yet flavorful and the wine sauce was complex and delicious. 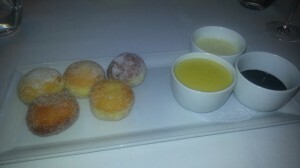 We sipped our Prosseco and waiting for the airy and light bombolonis.. well, they did not disappoint! The three dipping sauces including the pastry cream were yummy! After the yummy food and nice conversation, it was time to go. I was happy to go home and share my experience with my family and use the techniques I learnt in the Le Cirque kitchen!